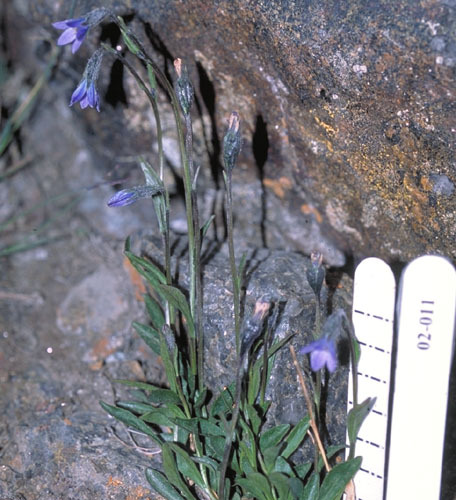 Flora of the Canadian Arctic Archipelago - Campanula uniflora L.
Published in Sp. Pl. 163. 1753. Vegetative morphology. Plants 5–10 cm high; perennial herbs. Taproot present. Roots pallid-brown. Ground level or underground stems vertical. Caudex present. Aerial stems branching from a tap at or near ground level into two or more branches, or developed; erect, or decumbent (or undulating). Leaves heterophyllous, or not heterophyllous (there is a difference in shape between the lower and upper leaves); mainly basal (in short plants), or distributed along the stems; alternate; dying annually and non-persistent. Petioles present (slight), or absent; 0–5 mm long; glabrous. Leaf blades simple. Leaf blade bases attenuate. Blades 10–35 mm long, 2–8 mm wide, spreading, linear or lanceolate (dark green), flat, veins pinnate. Blade adaxial surface glabrous. Blade abaxial surface glabrous. Blade apices acuminate, or acute. Reproductive morphology. Flowering stems solitary; conspicuously taller than the leaves; with leaves. Flowering stems glabrous. Flowers solitary (always, slightly nodding at anthesis). Flowers medium-sized, or large (in full flower). Sepals conventional; 5; free (from the top of the receptacle); 0.7–1.3 mm long; 3.5–7 mm wide; green. Calyx without sessile glands; hairy (cf. C. rotundiflora that has glabrous sepals). Calyx hairs pilose, or tomentose (sparse spreading hairs); non-glandular; white or translucent. Petals conventional; fused; 5; blue (a pale blue); with contrasting markings (blue and pale, blue to yellow); 7–11 mm long (corolla 4–8 mm in diameter); not spurred. 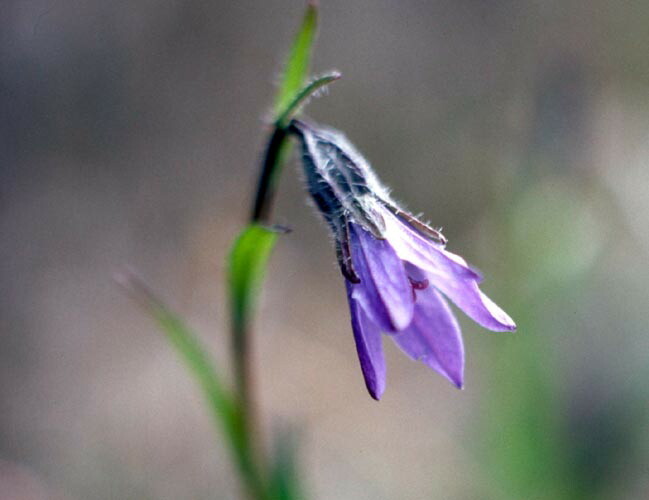 Corolla campanulate (narrowly bell-shaped, the lobes as long as the tube); 5-lobed. Stamens 5; stamen filaments glabrous; free of the corolla. Anthers yellow; long-cylindrical. Anthers splitting longitudinally. Anthers 1.5–2 mm long. Receptacle 5–10 mm high; surface hairy (on the exposed surface). Ovary inferior; carpels 3; syncarpous. Styles 1; 2.5–3.5 mm long. Stigmas per ovary 3. Stigma lobes 1.5–2 mm long. Fruit stalked; with calyx persisting; dry; a capsule; black (pale); 5–20 mm long (without the calyx); 4–7 mm wide; hairy (sparsely pilose); dehiscent (opening by slits). Seeds 100 (numerous); 0.9–1.2 mm long; brown; surfaces smooth. Chromosome information. 2n = 34. 2n = 34. Sørensen and Westergaard, in Löve and Löve (1948, Greenland); Löve and Löve (1956, Iceland; 1982a, Arctic Canada); Jørgensen et al. (1958, Greenland); Zhukova (1966, northeastern Asia); Knaben and Engelskjøn (1967, southern and northern Norway); Johnson and Packer (1968, northwestern Alaska); Dalgaard (1989, western Greenland). Ecology and habitat. Substrates: river terraces, ridges, cliffs; dry, moderately well-drained areas; rocks, gravel, clay; with low organic content; calcareous (Elven (personal communication, 2005) noted that this is a distinctly basiphilous species in northern Europe, but I am not sure that it is so in North America.). Found on wet clay seeps and cliff ledges, granite, basalt talus, boulder ridges of stream beds, gravel old screes. North American distribution. Alaska, Yukon, Northwest Territories Islands, continental Northwest Territories, Nunavut Islands, continental Nunavut, northern Quebec, Labrador. Range in the Canadian Arctic Archipelago widespread. Uncommon. Arctic, alpine. Arctic islands: Baffin, Devon, Ellesmere, Axel Heiberg, Parry islands (Melville), Banks, Victoria, Somerset, Southampton, Coats. Northern hemisphere distribution. Amphi-Atlantic, or amphi-Beringian, or North American. Northern Iceland, Svalbard  Franz Joseph Land, Polar Ural  Novaya Zemlya, West Chukotka, Wrangel Island, South Chukotka, East Chukotka, West Alaska, North Alaska  Yukon, Central Canada, Labrador  Hudson Bay, Ellesmere Land  Peary Land, West Greenland, East Greenland. General notes. 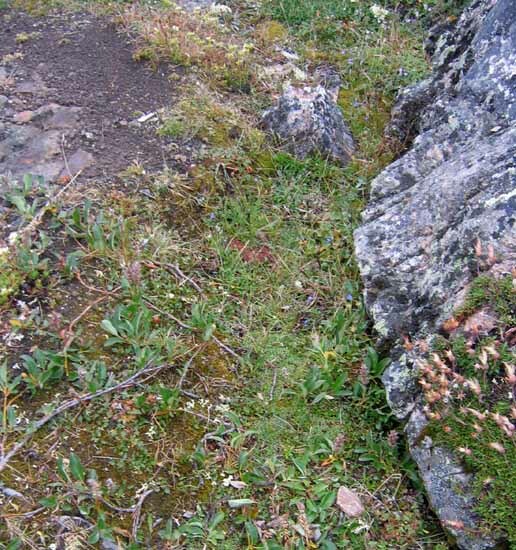 Holm (1922), in the reporting on the botanical findings of the Canadian Arctic Expedition, 1913–1918, provided a figure that showed the underground structure of this species and noted: "Some remarkably old specimens measuring 22 cm were collected on the south coast of Coronation gulf... The vegetative structure is quite interesting. The primary root is developed as a relatively large, wrinkled tap-root, bearing several shoot at the crown. These shoots are slender, and their subterranean part bears small, scale-like leaves, while toward apex small rosettes of green leaves appear, surrounding the flowering stems. As the main, i.e., the primary, root is wrinkled, indicating that it is contractile, the crown of the root becomes gradually pulled deeper and deeper down in the ground, at the same time as the subterranean parts of the stems increase in length. In young specimens the subterranean stems are thus much shorter, sometimes barely visible, the crown of the root being close to the surface of the ground." Illustrations. • Habitat: Dorset. 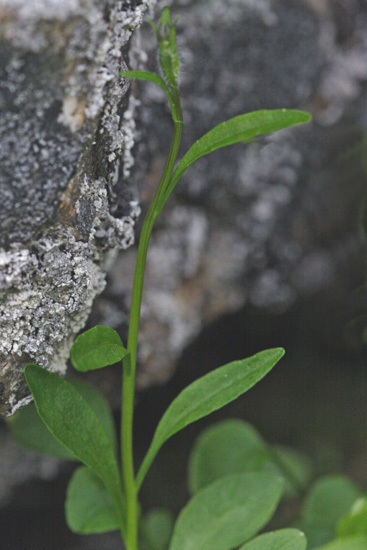 Plants growing in depression at the base of the rock. Nunavut, Baffin Island, Cape Dorset. 4 August, 2005. No voucher. • Close-up of plant. Plants nearly 20 cm tall growing in rocky crevice. Nunavut, Baffin Island, Iqaluit. Aiken and Mallory 02–011. CAN. Scale bar in cm. • Close-up of plants. 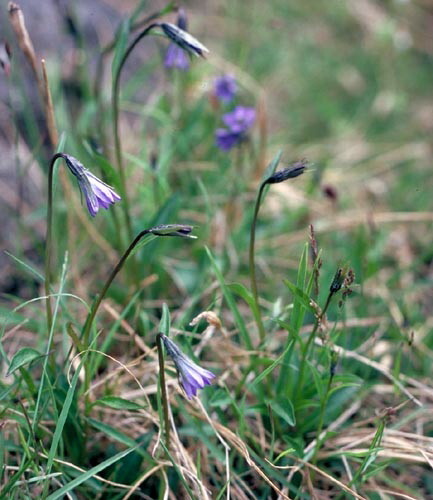 Blue flowers that face the ground early in flowering are parallel to it as seed develops. Fruit are erect capsules. Nunavut, Baffin Island, Cape Dorset. 4 August, 2005. Aiken. No voucher. • Close-up of leaves. Note heterophyllous leaves that vary from broadly ovate to narrowly ovate up the stem. Nunavut, Baffin Island, Iqaluit. 24 July, 2005. Photograph Kathy Thornhill. • Close-up of plant. 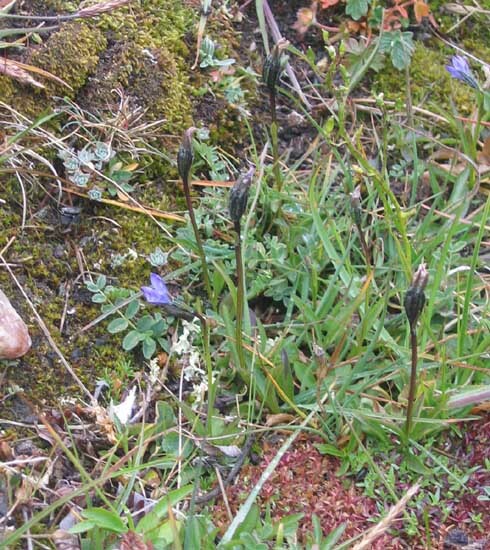 Plants, less than 10 cm high with blue flowers growing beside the marker in a disturbed habitat. Nunavut, Baffin Island, Iqaluit. J.M. Gillett 19006. CAN 466189. • Close-up of flower. 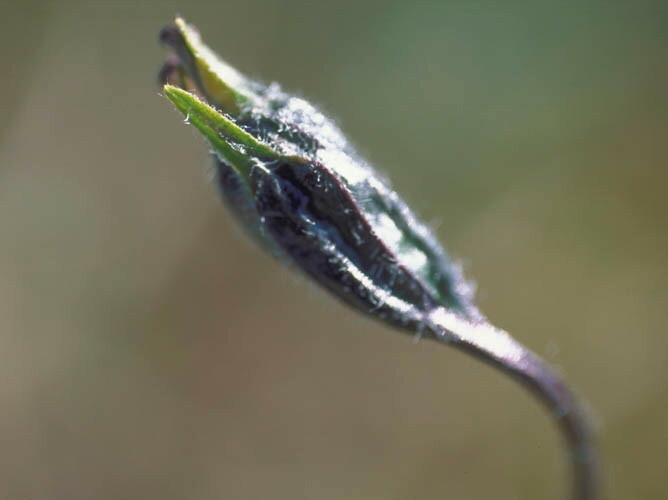 Close-up of flower with fused calyx and hairy leaves. Nunavut, Baffin Island, Iqualuit, J.M. Gillett 19006. CAN 466189. • Side view of flower. 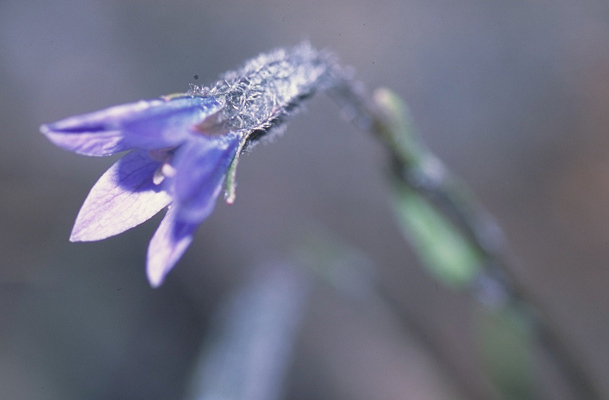 Flower with five fused blue petals, and a dark purplish black fused calyx that is hairy. Nunavut, Baffin Island, Iqaluit. Aiken and Mallory 02–011. CAN. • Looking into flower. Looking into the funnel-shaped and fused blue corolla. 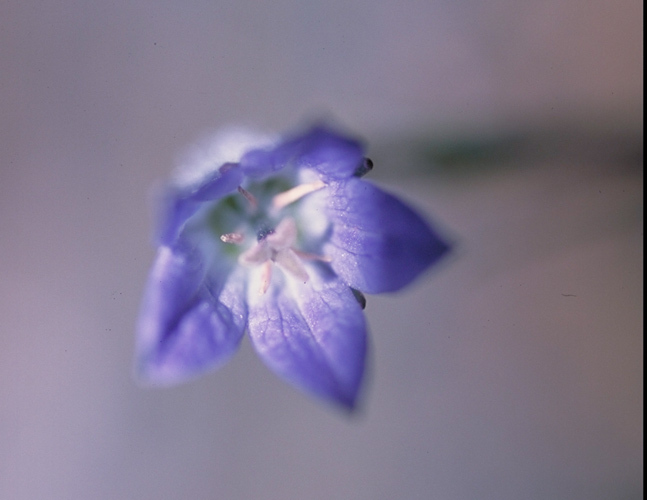 Note the deep blue on the tips of the five petals, the anthers attached to the petals, and the five stigmas from a central style (one lobe on top of another). Aiken and Mallory 02–011. CAN. • Close-up of fruit. Purple blackish fruit developing from an inferior ovary with the withered remains of the flower on the top. Nunavut, Rankin Inlet. Aiken and Brysting 01–058. CAN. • Arctic Island Distribution.